And here I was, feeling all snappy confident on my second Gemeindebau outing. I did a little research and prepared a map of locations to pursue with my camera, but was foiled by a Russian grocer and my heavy grocery bag; a stamp and coin shop (The Tween collects certain coins); and a used record store (The Teenager is into vinyl) among other interesting sights, and thus lost track of where I saw most of what I saw. Something tells me this is how it will be. One of my first photos coming up from the U-Bahn. This large complex is the Heizmann Hof, so named for a locksmith and member of the resistance who was sent to, and executed in, the Mauthausen concentration camp in Austria. The courtyard gates deter one from prying into the courtyard of those residing in the buildings, and rightly so. 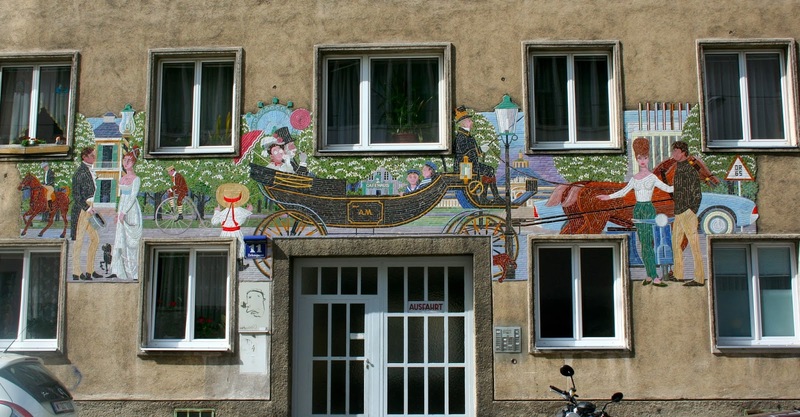 Down the street, a spirited mosaic on a building whose location I neglected to record, a recurring theme on this outing. A turn down Ybbstraße revealed a construction from 1927. With another foreboding gate. And then I looked up to find whimsical reliefs of plants and animals. More 1920’s construction with Art Deco features. 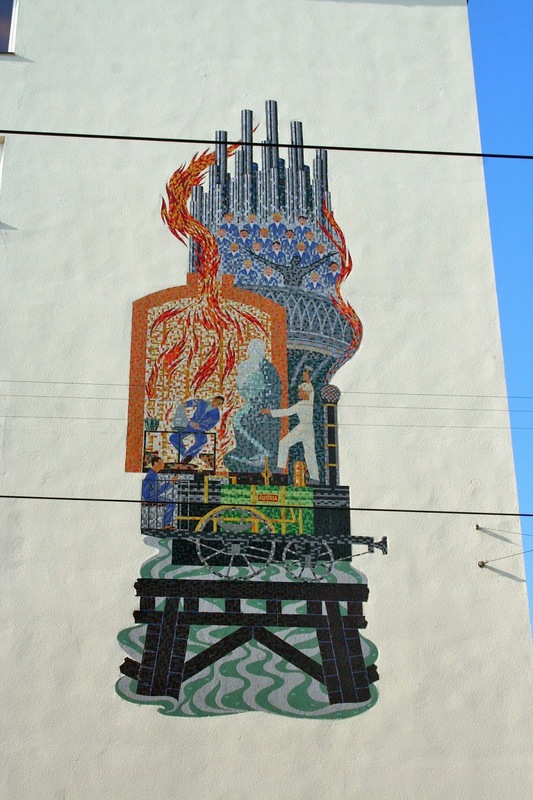 Though I noted the location, I could find no information on the striking art that frames the corner of this building. Graffiti was everywhere. Really, people? “Oh,” I thought. “This is so dreadfully utilitarian. The slight hint of blue in the balconies (or stairwells?) does not help this poor building’s cause.” I became even more sad when I read the building’s name: Chopin Hof. Yes, a lyrically mute building so named for a great Polish composer. Did someone in the Gemeindebau Naming Department not like great classical music? A relatively recent construction, dating from 1985. Equally as mute as Chopin Hof. This is not Kunst am Bau, but rather, a commemoration of the battle to defend Vienna from the Turkish invasion in 1683. I would not have rated this art a finalist in the Post-War Reconstruction Aesthetics Competition. This one, though, is more to my liking. My favorite mosaic of the outing, but the history of this striking piece remains a mystery to me. By no means do I consider my outing to be a failure. Not at all. If anything, I am further inspired to continue wandering Vienna’s streets. Vienna is truly full of amazing sights. Hi Victoria, maybe I'm able to help you out with the meaning of the last mosaic. From what I've seen so far, I can not disagree with that sentiment. Something tells me, though, that I will fall short of seeing them all while I am here. which is what ( Pardon my english..). You have to look at the inscriptions because ” Kunst am Bau” was imposed on every single project. reo, thank you for adding a new level of “research” to my outings!